We got bikes! This morning we took a cab to the Giant store to search for a bike. The store had a great selection of bikes that were all decently priced. After going back and forth between a cruiser and hybrid bike, I decided on the hybrid. The guy at the shop let me take it for a test drive down the street….the breaks felt a little weak so they tightened them up for me. The bike felt a little small but the weight and color sold me. It didn’t come with a kickstand but was able to have one installed before we left. Oh and of course I bought a helmet! Less than $500 for a brand-new bike, kickstand, and helmet. The only weird thing about it is the disc breaks….not sure how I feel about those! Since we had cabbed it to the bike shop one of us was going to have to ride the bike home. Jason volunteered and ended up beating me home! After an afternoon nap we rode our new bikes to the pearl market to pick up my clothes that I had ordered last week. The whole adventure took about 20 minutes and was pretty easy. Having a bike really makes getting around a lot easier! 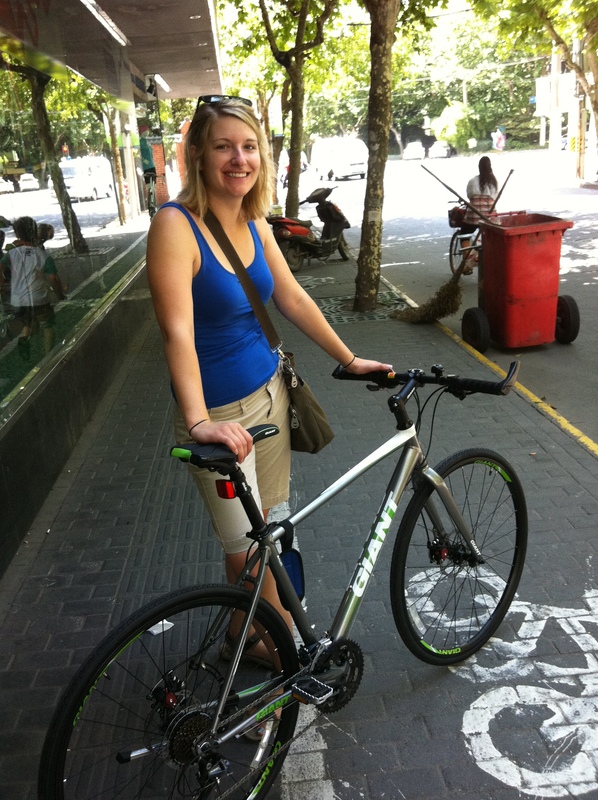 Actually biking in Shanghai is pretty nerve racking because you don’t really have to follow any traffic laws! In fact I noticed the more careful I was, the more dangerous it seemed. Cars yield for you but you can never really tell if they will! So for example when the light was red we just went for it and weaved in and out of traffic! Not to worry –we wore helmets and really, we were the only people wearing helmets! Once all of our friends get bikes it will be nice to bike around the city! 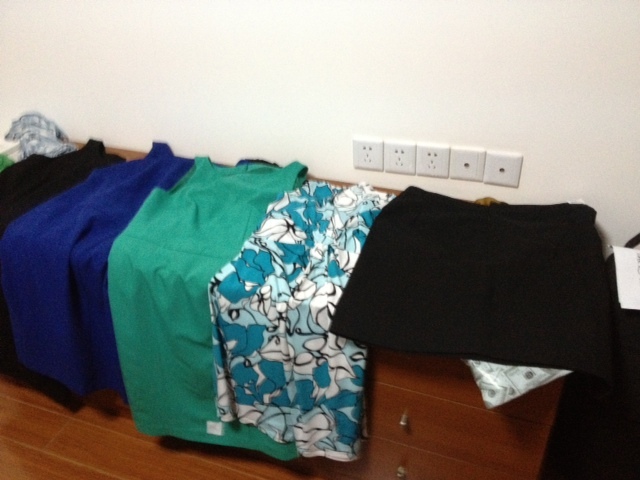 Oh and the clothes I picked up are awesome. The dresses that I got are a perfect match and fit great! August 16, sorry for the delay!! Almost done with our first week. Oh, how exciting. Say, Angela, do you think that we could set up something so that I could have some clothes made? Would love to have a pair of slacks made a size smaller and several more pairs made like them. What do you think?